Oxtail Studio is pleased to announce the opening of Wild in Disguise, a series of works on paper by Bay Area artist Jaclyn Finkle. Jaclyn’s home studio is at Fulton X Crossing in Sonoma County. Wild in Disguise plays on the popular trend of anthropomorphizing animals that has been alive in one form or another for centuries. From Ancient Egypt to Etsy, the desire to domesticate that which is wild is a timeless pursuit. Jaclyn captures the “personality” of each of her subjects by adorning them with human accessories. 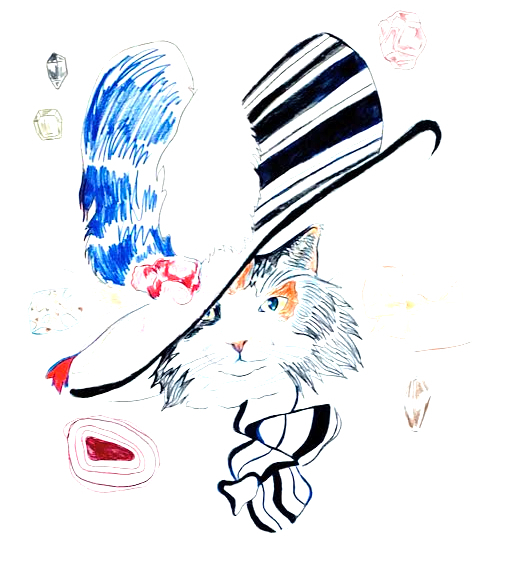 The flamboyance of an ascot hat lends a dash of Britsh vogue to a long-haired house cat; while a monocle and bowler hat supply a chimp with simian shrewdness. Jaclyn incorporates gemstones into her quirky portraiture as a nod to the healing capacity of art production. Both the gemstones and the animals embody the human desire to polish and civilize. At the same time, the roughness of nature peers through the façade of refinement. She captures a classic duality and strikes an uncanny balance where wild animals become familiar friends. We are all sophisticated beasts, after all. In keeping with the theme of feral sophistication, Jaclyn will also have greeting cards on offer that depict sumptuous floral arrangements originally realized in pastels on paper.